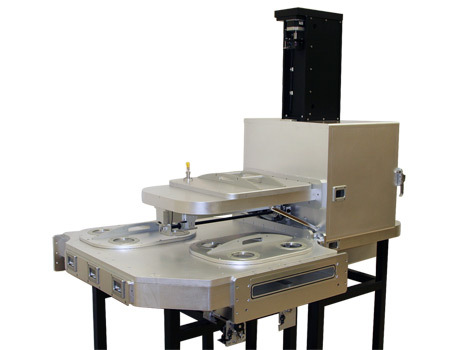 The Carousel-200 is a compact, high-vacuum compatible loadlock and transfer system designed to deliver up to 200mm wafers or other flat substrates from a SEMI-standard cassette into a process chamber. This small footprint system is a clean, cost-effective alternative to other accepted transfer devices. After a preloaded wafer cassette is inserted into the load chamber, wafers can be repeatedly pulled from the cassette and delivered to the process chamber without breaking vacuum. A unique revolving wafer carrier exchanges wafers between two independently controlled drive mechanisms. These dual drives allow increased throughput as one drive can be removing a wafer from the cassette as the other is delivering a wafer to the process chamber. The load chamber is equipped with an elevator drive assembly. For process chambers without vertical lift, z-lift capability is optional. The Carousel can be configured for SMIF operation. 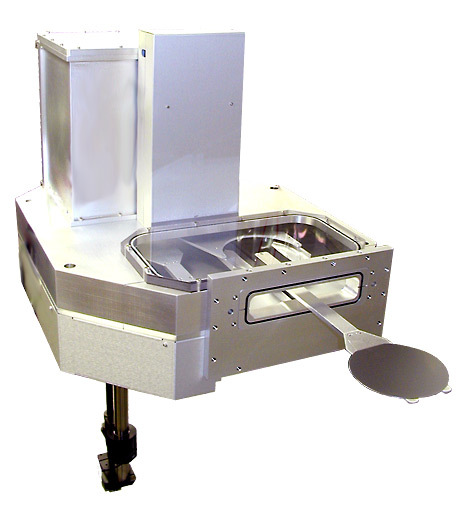 The Carousel-200 handles up to 200mm wafers, reticles, masks or substrates of varying sizes. Applications include process development, use as a manufacturing tool or for low-volume production. Wafer Cycle Time Typical exchange 15 to 20 sec. Customized Carousel chambers can accommodate substrates in a wide range of shapes and sizes. The Carousel valve interface can be modified to mate to a variety of vacuum systems. The Dual Directional Carousel 485 with attached Dual Chamber Cassette Loadlock is another example of the UHV Transfer line of standard and custom loadlock, vacuum transfer and positioning systems. In the loadlock, 485mm substrates can be loaded into the 12 level cassette held in the cassette elevator. Any of the twelve substrates can be selected and moved to the bakeout chamber or after pump down it can be transferred through a gate valve onto a delivery arm within the Carousel 485. Two heavy-duty, motorized, magnetically-coupled drives deliver the substrate into either of two process chambers on opposing sides of the Carousel system. The Carousel maintains UHV levels throughout the transfer process acting as a buffer between the process chambers and the cassette loader. 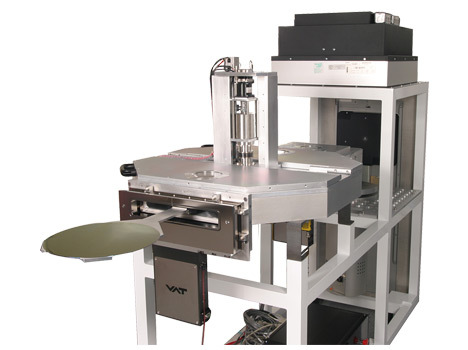 This customized system is capable of handling customer-specified substrates with either a 370mm or 480mm diameter.